What does an afternoon watching a film on homelessness at Café Zippy have to do with plastic spoons? Everything. At least everything to Susan and Sharon’s incredible volunteering at Interfaith Association of Northwest Washington’s Family Shelter. Susan first found Interfaith Association of Northwest Washington at Café Zippy during a presentation of the Faith and Family Homelessness Project from Seattle University. Susan picked up Interfaith’s information. The rest is history! Sharon found us via our annual fundraiser and was called to action in making family flowers (out of plastic spoons) to adorn the walls on the evening of the event. Sharon wanted to help more. Susan and Sharon met at the Family Shelter. Since then they’ve been our go-to duo having anything to do with sewing. 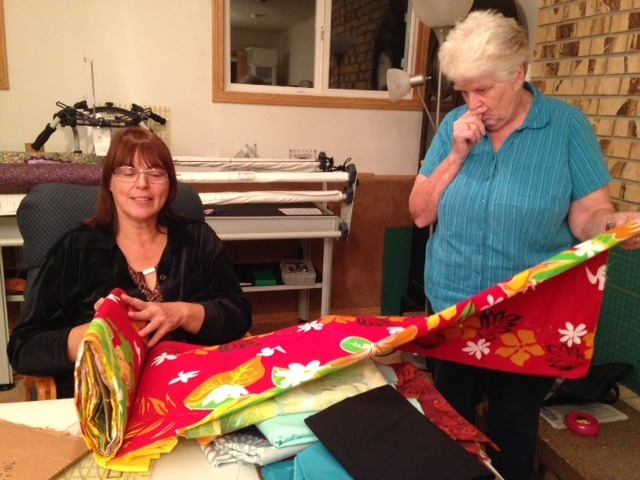 Their main focus is working at the shelter teaching sewing skills to all interested residents, completing projects such as pajama bottoms and tote bags, and mending clothes or other items as needed. To date, one family went to their new apartment complete with a sewing machine of their own!